Muslim-Americans Try To 'Write' Hollywood's Wrongs Since Sept. 11, 2001, Muslim-Americans have been disappointed about how they are portrayed in film and television. Now, the Muslim Public Affairs Council is putting on workshops with veteran Hollywood writers to teach Muslims how to write their own scripts. The movie MOOZ-lum is filmmaker Qasim Basir's effort to bring images of Muslims to the screen that are both nuanced and universally identifiable. It's Saturday morning, and several dozen Muslims are gathered in a college classroom in Los Angeles. There are men and women, young and old, U.S.-born and immigrants, but they all have a common dream: to break into show business. In television and films, however, Muslims are often portrayed as the bad guys, like the terrorists seen in FOX's 24 or in the Bruce Willis film The Siege. A group called the Muslim Public Affairs Council has been working with Hollywood studios for years to foster more accurate portrayals. And recently it has adopted a new tactic: The group is teaching Muslim-Americans how to become Hollywood screenwriters. Marium Mohiuddin, communications coordinator for the Muslim Public Affairs Council, says in the past the group had some success consulting non-Muslim writers and producers at Hollywood studios. But realistic depictions of Muslims, both positive and negative, are still rare, she says. "The Muslim-American community is kind of at that point, 'We're like OK, we want these stories to be told. You're not telling it, so we have to do it,'" she says. So they've enlisted insiders like Oscar-nominated Tom Cook to teach courses specifically tailored to Muslims. "I've always thought of writers as outsiders, and who is more of an outsider in modern day America than Muslims?" Cook says. Among those taking notes from the veteran writer is Pakistani-born Avais Chughtai. "One of the things Tom Cook said [is], 'What the Hollywood industry likes is experiences, you know, the personal experiences,'" Chughtai says. "But it's up to us to actually go and write those experiences and share them." The workshops also brought in agents and executives who explained how to turn those experiences into scripts that actually get made, which as Qasim Basir can attest, is no small feat. 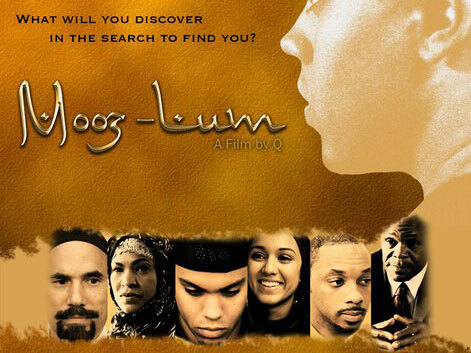 Basir wrote and directed the recent feature film MOOZ-lum, a semi-autobiographical tale of a young African-American who struggles with the challenges of being raised Muslim. Finding financing for MOOZ-lum was a real challenge, Basir says. Hollywood executives didn't quite know what to do with a film about African-Americans who were also Muslims. "Because we know how to sell Big Momma's House 4, you know? We know how to sell the Tyler Perry movies, but this here — who's the audience for this?" Basir says. So far, MOOZ-lum has played well with Muslim audiences, but Basir hopes that the film will find success with non-Muslim moviegoers, too. And not just for commercial reasons: The filmmaker says he wants to improve the impression many Americans have of people like him. "I am seeing a level of discrimination in this country that I have never seen in my life," he says. Mohiuddin says it's easy to see why many Americans would fear Muslims when the only real exposure they get to Islamic life comes from the media. "If all you see is bad, bad, bad, then how are you ever going to tell the American community that 'Don't worry, you're fine, your Muslim neighbor is not going to do anything to you?'" she says. But could TV shows and films actually have the power to curb prejudice? Diane Winston, who specializes in religion and media at the University of Southern California, says there is some precedence. "I have seen studies which suggest that American ideas about gays were changed by shows like Will and Grace," she says. Winston hopes these workshops will inspire writers to create the Muslim equivalent of The Cosby Show or a CSI detective who's just like other cops, but he has a prayer rug in his office. "Now more than ever, we need media representations to remind us that Muslims are our fellow citizens," she says. "That they are doctors, lawyers, policemen, teachers — just like the rest of us." The Muslim Public Affairs Council will be keeping its eyes open for such portrayals. Later this spring it'll hold its annual version of the Golden Globes — an awards gala for the best depictions of Muslims in television and film.